Whether you've been applying makeup for decades or are just starting out, covering large pores or blemishes can be a challenge. Most people use a damp beauty sponge or their fingers to apply foundation, but both of those options can leave telltale marks or imperfections in the finish. To get optimal results, especially when applying makeup to your nose, you need a small brush with tapered bristles. This will allow you to stipple foundation onto the nose in small strokes. Unlike buffing or using a sponge, stippling presses foundation into the skin, so that the pores are less visible. This also works best when you're covering blemishes, because the bristles won't disturb the tender skin. 1. Put a small amount of liquid foundation on a mixing palette or on the back of your hand. 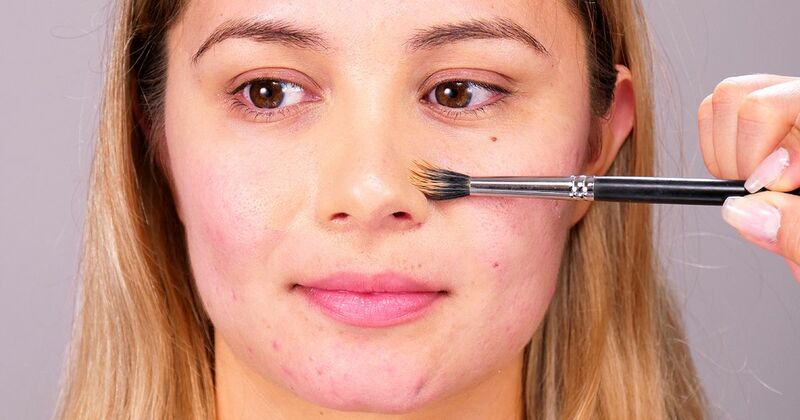 Dip the tapered brush into the foundation, then apply it to your nose in small strokes. Tip: Take your time. It may take longer to apply your makeup using this technique, but the finish will look better and last longer. 2. Dab a damp beauty sponge into the foundation, and apply it to the other areas of your face. Allow the makeup to dry for 2 to 3 minutes before proceeding. 3. Sprinkle loose setting powder onto a powder puff, then fold the puff in half like a taco. Press the two sides together to work the powder into the puff, then pat it against your face to set your foundation. Now, check your work in the mirror. Your pores should look less visible, and any blemishes should be completely covered. What a difference a brush makes! Share these makeup tips on Facebook. Check out this advice on how to define and arch unruly brows. Don't let date night makeup stress you out. This romantic look is easy to create with neutral colors. Want sheer, natural coverage without the heavy texture? This video is for you!